A large park with many slides and watery diversions, Adventure Island can provide many hours of fun and relief from the Florida sun. Among its highlights are Riptide, a four-lane mat racing slide, and Wahoo Run, a partly enclosed family raft ride. Thrill-seekers would enjoy the Gulf Scream speed slide as well as the intertwined, double slides on the Caribbean Corkscrew. In 2015, the park added Colossal Curl. Passengers in four-passenger rafts ride through an enclosed slide, enter a mini funnel, and drop into a half-pipe element for some negative G-forces. 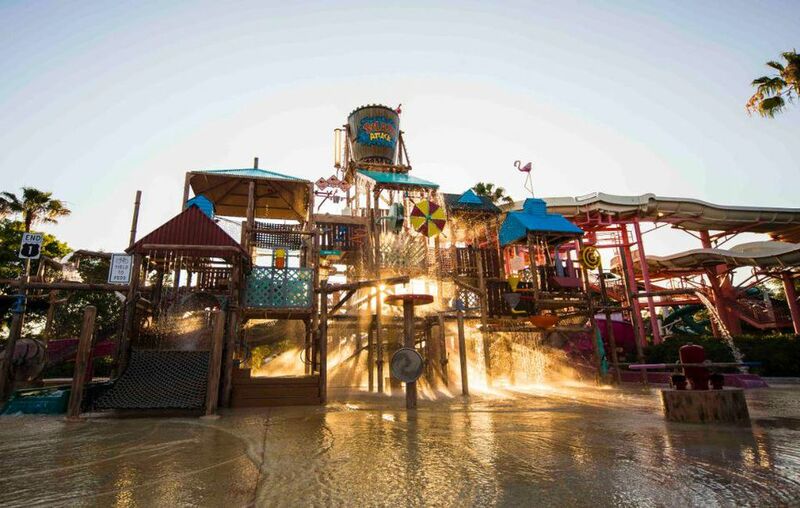 For younger children, Adventure Island offers a number of attractions, including dozens of interactive water elements at Paradise Lagoon and pint-sized fun at Fabian’s Funport. Everyone can enjoy the Rambling Bayou lazy river and the Endless Surf wave pool. There are also volleyball courts. Compared to other major water parks, Adventure Island comes up short in signature attractions, however. It does not have a water coaster, bowl ride, or half-pipe ride, for example. Unlike other theme park/water park hybrids, Adventure Island and Busch Gardens Tampa are not really designed for guests to travel back and forth and sample attractions from each park in a single visit. The two parks have separate gates and separate admission fees. And while the parks are near one another, they are not adjacent and are not easily accessible from each other. Adventure Island requires separate admission from Busch Gardens Tampa. Combo tickets may be available. Check with Adventure Island. Reduced price for children 3 to 9. Ages 2 and under are free. Private cabanas are available for rent. Season passes and special promotions available for Florida residents. The SeaWorld parks (of which Adventure Island is a part) are known to have decent food. Options include the usual fast food and park suspects as well as flatbreads, fresh salads, wraps, and Italian sandwiches. Treats include frozen drinks (non-alcoholic and alcoholic), waffle cones, smoothies, and sundaes. The park often has special offers such as a pay-one-price, all-day dining deal. Adventure Island is generally open daily from April through August. It is also open weekends and selected weekdays in March, September, and October. The park is closed November to February. The actual address is 10001 N. McKinley Drive in Tampa. From Orlando: I-4W to I-75. Head NORTH on I-75 to Exit 265, Fowler Ave. Bear left on exit ramp onto Fowler Avenue. Go west on Fowler Ave. to McKinley Drive on left. From the North: I-75S to I-275S to Exit 51, Fowler Ave. Go left (east) onto Fowler Ave. to McKinley Drive. From the South: I-75N, past the I-4 intersection, to Exit 265, Fowler Ave.Bear left on exit ramp onto Fowler Avenue. Go west on Fowler Ave. to McKinley Drive on left.